The US ambassador to the United Nations, Nikki Haley, came to Washington to announce the decision alongside President Donald Trump's top diplomat, Secretary of State Mike Pompeo. 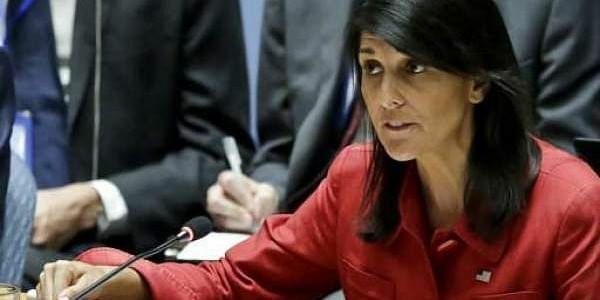 WASHINGTON: The United States withdrew from the United Nations Human Rights Council on Tuesday, condemning the "hypocrisy" of its members and its alleged "unrelenting bias" against Israel. Both insisted the United States would remain a leading champion of human rights but, for many, the decision will reflect Trump's general hostility to the world body and to multilateral diplomacy in general. "These reforms were needed in order to make the council a serious advocate for human rights," Haley said. "For too long, the Human Rights Council has been a protector of human rights abusers, and a cesspool of political bias. Regrettably, it is now clear that our call for reform was not heeded." In particular, the council's focus on Israeli behavior towards Palestinians in the territory it occupies on the West Bank and in Gaza has infuriated Washington. "Countries have colluded with each other to undermine the current method of selecting members," Pompeo said. "And the council's continued and well-documented bias against Israel is unconscionable," he said. "Since its creation, the council has adopted more resolutions condemning Israel than against the rest of the world combined." Israel's Prime Minister Benjamin Netanyahu welcomed the US move, branding the council "a biased, hostile, anti-Israel organization that has betrayed its mission of protecting human rights." "We take this step because our commitment does not allow us to remain a part of a hypocritical and self-serving organization that makes a mockery of human rights," she said. UN Secretary-General Antonio Guterres regretted the US decision, adding: "The UN's human rights architecture plays a very important role in the promotion and protection of human rights worldwide." On Monday, UN High Commissioner for Human Rights Zeid Ra'ad Al Hussein -- a Jordanian -- had rebuked Trump over the US practice of splitting up migrant families detained on the Mexican border. "The thought that any state would seek to deter parents by inflicting such abuse on children is unconscionable," he said. Independent watchdog Human Rights Watch criticized the move, warning Washington's absence at the council would put the onus on other governments to address the world's most serious rights problems. "The Trump administration's withdrawal is a sad reflection of its one-dimensional human rights policy: defending Israeli abuses from criticism takes precedence above all else," executive director Kenneth Roth said. "The UN Human Rights Council has played an important role in such countries as North Korea, Syria, Myanmar and South Sudan, but all Trump seems to care about is defending Israel." Known as "Item 7", this items means that Israel's treatment of the Palestinians comes under scrutiny at each of three annual sessions. The United States refused to join the body when it was created in 2006, when George W. Bush was in the White House and his ambassador to the UN was John Bolton -- now Trump's UN-skeptic national security advisor. But when Trump took office, he adopted a hostile approach to world governance, leading Washington to quit the UN cultural agency UNESCO, cut UN funding and planning to leave the Paris climate agreement.